pugnency are released as the tiny snow dragons roar back to life. Repeated steeping can be yielded from this premium white tea. such a highly respected white tea by connoisseurs. This tea looks sooooo neat from the time I took it out of the package until the very end of the cup!! The leaves are tightly spiraled and slightly fuzzy! Post infusion the leaves are much different in every way – color, texture, size, you name it! The Spirals unwind and the slightly fuzzy feel of the leaves turn more rubbery – at least that’s the way they look! Sure this tea is neat to look at and even has a cool name BUT it tastes great, too! 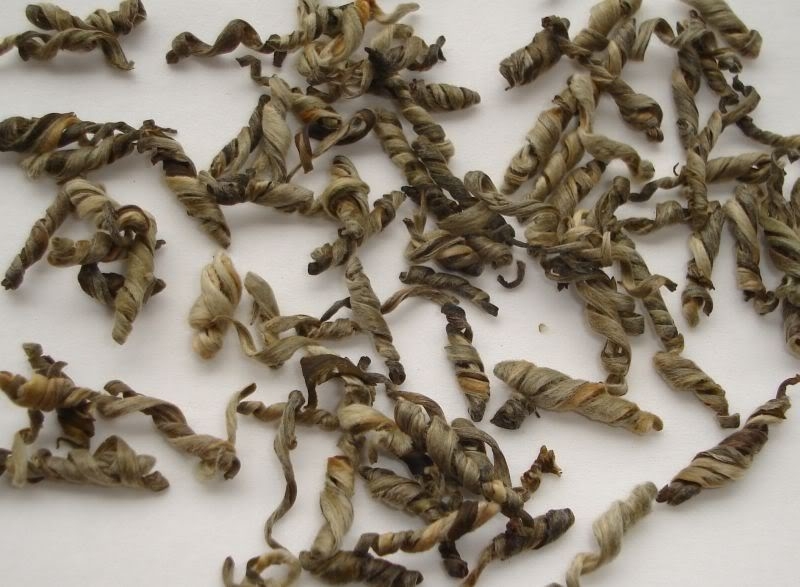 It’s a very powerful white tea – taste-wise…maybe somewhere between a green and a white. In the middle of the sip I can relate to the jam-like mention in the description! This is a FUN tea! Ideal for a chat between friends or at the end of the day while unwinding…either way it will NOT disappoint!